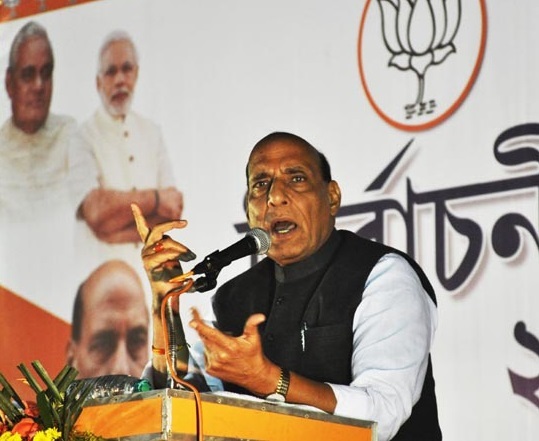 An upbeat Rajnath Singh on Saturday exuded confidence that the Bharatiya Janata Party (BJP) will dethrone the Left Front government in Tripura in the ensuing Assembly elections. “The Lotus will certainly bloom in Tripura as the people of the state are eagerly waiting for a BJP government,” said Union Home Minister Rajnath Singh while addressing an election rally at Barjala in support of party candidate Dr Dilip Das. Singh said though he had visited Tripura several times before, but never ever seen such huge gathering in support of BJP. “I cannot understand what the CPI(M) government led by Manik Sarkar did for the people, when poverty is increasing day by day,” he said. He also asked the Manik Sarkar government to take lessons on development schemes from BJP-ruled states. He also alleged that the State Government is unable to safeguard the womenfolk from atrocities. He also expressed his concern over low conviction rate of Tripura and termed that Tripura is safe haven for crime. Singh added that every poor family of the country will have health insurance coverage of Rs 5 lakh. Singh also assured that every household of Tripura will have electricity connections and programmes for employment generations, if BJP is voted to power.. He also appealed the people of the State to vote for BJP and usher in ‘development’ to Tripura.